Inheritance by Christpher Paolini. An Inheritance Cycle Book. Review: Have you ever traveled to a world beyond imagination? That world could be defined as Alagaesia. But right now it is at war. 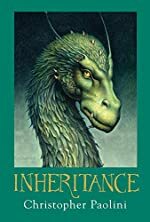 In Inheritance written by Christopher Paolini, also part of the four book Inheritance series, the Varden are trying to overthrow the almighty king Galbatorix. They have had a very long battle and it is finally wearing down. The battle is at the hardest stage for the Varden. They have to battle two of the strongest cities around. And then to cap it off, they have to beat Galbatorix and Shruikan. All races including humans, elves, dwarfs, urgals, and riders alike will fight for the Varden. But will this be enough to defeat the corrupted king and save Alagaesia? Eragon is the last free dragon rider with his dragon Saphira, and Arya is a messenger. However, they all bow down to Nasuada. Because they have gone through many battles and won with her as leader. She has been the leader of the Varden ever since her dad died. Now the war is close to ending. With everybody on her side, she has won the battles with ease. But the main question is whether somebody could replace her. Because when Murtagh kidnaps Nasuada, Eragon is forced to take over. Can Eragon and Saphira win the biggest battle of them all, or will he die trying? I rate Inheritance five out of five. Paolini is one of the top authors of all time. With his combination of creativity and details, he can go far. Inheritance is just his first homerun. I would even say this is the best book of the series. This book paints a picture bigger than the mind can see. When I met him, it showed me that he is a kind and inspired man. The Inheritance Cycle is just the spark of his certainly prolific writing career. Inheritance is a must read. It contains one of Eragon and Saphira's best adventures yet. Plus, the details that book contains will make you feel as if you are in the adventure yourself. This book can be thoroughly enjoyed at all ages. The quote "I just wanted to make him understand," said by Eragon means that he didn't even mean to kill Galbatorix. It also meant that he just wants to show Galbatorix how much pain he has caused and how he had been truly selfish. That quote painted a whole picture about how intense life is in Alagaesia. This book shows a whole lot about the adventure and how this really would represent Alagaesian history. Finally, Eragon's character is easy to relate to. He is a noble, courageous man who would sacrifice anything to free the people of Alagaesia. He is also a brave soldier who fights cleanly and will fight until his last breath. I hope this book inspires like Saphira's fires. Review written by Joseph (6th grade student). We would like to thank Joseph for providing a copy of Inheritance for this review. Have you read Inheritance? How would you rate it?